Every two years, the Young Crystallographers Group of the British Crystallographic Association nominate a speaker to give the prestigious Kathleen Lonsdale Lecture. 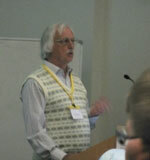 Traditionally, they invite well respected scientist who has a good rapport with students. This year the Lonsdale Lecturer was David Watkin who is well known within the community, principally as a result of his involvement with the highly respected refinement software CRYSTALS, developed in Oxford and through the BCA biannual teaching school which he co-founded twenty-five years ago. 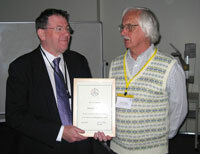 David Watkin has been elected as Honorary Member of the British Crystallographic Association for his outstanding services to the organisation and crystallography as a whole. The award was made in particular recognition of his role as a teacher, in both the UK and worldwide. The presentation was made at the annual meeting of the BCA which was held at the end of April at Loughborough University.